So by now you'll all know about my candle addiction but I can't help but admit that it has completely lessened off now that the warmer weather has come around and I still have lots of christmas scents left. Over-buying mistake, I think so? I knew I needed some summer scents but there was something that still had me feeling a little sceptical as I wasn't sure I liked the idea of the warming candle like idea in this weather... (or lack of at the minute!) 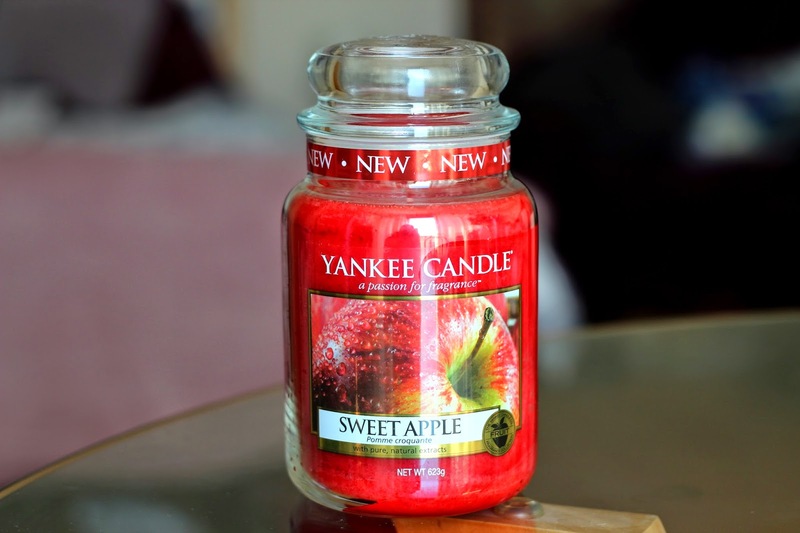 but when this candle, the gorgeous Yankee Candle Sweet Apple Large Candle Jar* came into my life it was all turned around. I didn't think I'd ever choose an apple scent, I'm usually an orange kinda gal but this is just beautiful! If you see this in a store, you need to go and sniff it. I remember when I first got it and I smelt it for the first time, I just couldn't stop. I didn't want to burn it because I didn't want it to go. I found that during the winter months I'd burn candles so excessively that they would all finish so quickly. I bit the bullet and have been burning it since and boy am I loving it. It burns well, it smells amazing and I love the look of it. My first Yankee Candle Large Jar Candle and I can assure you it won't be my last. What are your favourite Yankee scents?